LifeCell International – India’s leading stem cell provider, a pioneer in stem cell research– announced the launch of Baby Cord Share, Community Stem Cell banking to address the need for creating a large inventory of stem cells in the country. BabyCord Share brings together the unique benefits of private and public banks, while effectively addressing the challenges of sourcing matching stem cells in India. 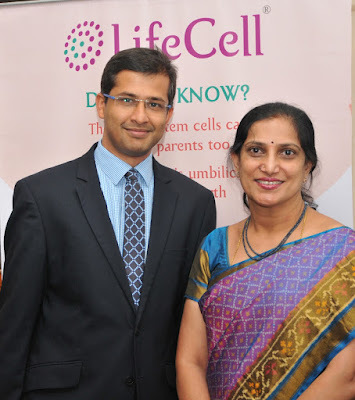 Mayur Abhaya, MD and CEO, LifeCell said, “With increasing awareness amongst the parents preserving their baby’s stem cells, community banking could help increase the inventory by more than 50,000 every year. Through community banking of cord blood units, India has the potential to become the largest inventory of stem cells globally, increasing the scope of potentially lifesaving stem cell transplants for babies, their families, their communities and others of Indian origin worldwide. As per a study funded by the Indian Council of Medical Research (ICMR), if 2.5 lakh stem cell units of Indian origin are made available, chances of patients in India finding a matching stem cell unit will exceed that of even a patient in advanced countries such as U.S. Moreover, the cost of sourcing matching stem cells from public banks from elsewhere in the world could cost around Rs 15 to 20 lakhs making it unaffordable to many. The community stem cell banking will be available to customers with immediate effect at a starting price of Rs 16,990 with an Annual Storage Fee of Rs 4,000 per annum. LifeCell also offers additional long-term plans wherein customers can choose to prepay the storage fee. BabyShield, LifeCell’s preventive genetic screening and diagnostic testing services, is India’s market leader for newborn screening services and recently forayed into prenatal screening.